All requests for Sacramental Certificates (official documents attesting to a sacrament having been conferred –not issued for family history purposes) should go to the parish that holds the original sacramental record book. The requester must be an authorized recipient as defined below. 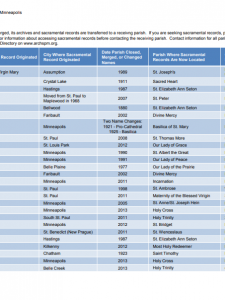 In the case of parishes that have merged, the records reside with the receiving parish. A list of the location of records for merged parishes can be found under Downloads below. The individual named in the record (if over age 18 or an emancipated minor). A parent or legal guardian of the individual (if the individual is under 18). Officials of the Archdiocese of Saint Paul and Minneapolis, other dioceses, or of parishes of the Archdiocese or of other Roman Catholic dioceses. Other parties as designated or permitted by court order, subpoena, summons, or state or federal statute. Parishes do not provide sacramental information for genealogy research, nor are sacramental certificates issued for that purpose.